Percussionist Paul Lytton (1947) is both an inventive, textural drummer in the tradition of European free jazz, and a pioneer in electronic sound processing and the use of homemade instruments of his own invention. Lytton made his first noteworthy appearances on the British creative music scene in the late ’60s where got to play drums on the timeless classic debut album by ‘The White Noise’. Simultaneously he began experimenting with free improvisational music and starts a collaboration with multi reedist Evan Parker. The duo released a couple of groundbreaking albums on the Incus and Moers Label. Lytton was a founding member of the London Musicians’ Cooperative and collaborated with various other artists on the London improvisers’ scene from 1970 until 1975. He also developed a strong relationship with Aachen-based percussionist Paul Lovens which resulted ina few albums on Lovens’ label Po Torch. Furtehrmore he has worked with a.o. Barry Guy, Fred van Hove, Derek Bailey, Alexander von Schlippenbach and more recently with Ken Vandermark and Nate Wooley. Lytton has performed in Europe, the United States, Canada and Japan as a soloist and in various combinations with other improvising musicians. Lyttons recent works have been released on the famous ECM label. Since about 40 years Hans Reichel has been internationally recognized as one of the leading innovators of the acoustic and electric guitar. From the beginning he has found himself not only expanding the range of playing techniques, but also designing and making instruments with entirely new features. With the research and the musical output influencing each other, he has achieved a wide range of unique sound possibilities which set him apart from contemporary guitarists. Since the mid-eighties he also plays the stringless daxophone which is equally of his own invention and design. With a startling resemblance to human and animal voices, it is an array of oddly shaped wooden tongues being „animated” by the stroke of a bow. The design and function of his instruments have been frequently discussed at length in major American, Japanese and European periodicals. 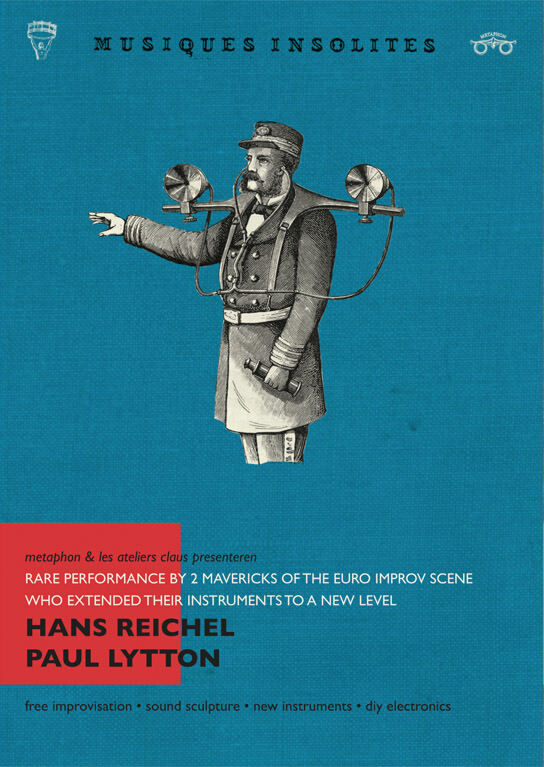 Reichel has always committed himself to improvised music (instant composing) which he believes is one of the most stimulating and entertaining forms to display musical ideas, spontaneous group interaction, and fun to the public. His work has been released on many LP’s and CD’s, mostly on the notorious German FMP label. Besides he has toured all over Europe, North America and Asia and worked with many influential musicians of the international avantgarde and improvised music scene aswell with artists from different cultural and stylistic backgrounds like Korean Komungo players, Japanese Butoh dancers and Shakuhachi players. Furthermore Reichel has given many lectures and workshops and his music has been featured in various theatre pieces and movies. In the beginning of 2001 he was commissioned to make a daxophone sound-track for Shakespeare’s “Comedy of Errors”.